If you didn’t already hear, the keyword based SEO strategy is gone. Done. Over. Developments by Google from the Panda update in 2011 to the rollout of RankBrain and recent changes in the Adwords Keyword Planner...the writing's on the wall - it’s time SEOs have a new strategy for content. Going after single keywords based on search volume is a strategy only the big brands can achieve, and even they are having difficulties with that approach nowadays. Whether you work for a big brand or a local startup, SEOs need strategies and tools to handle the advancements of Google and create great content. 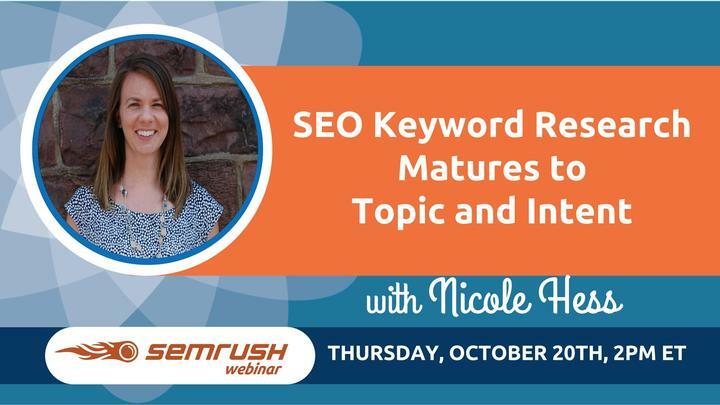 In this webinar, Nicole will share the tools and processes that she and the team at her agency, Greenlane Search Marketing, use to research topics, search intent and semantics. We’ll cover the main steps to our processes, examples, and a Greenlane custom tool that has cut our research time by 375% (no joke, you’ll see!). Specifically, we'll cover: 1. Intro and status check on SEO research: What are you really trying to find? 2. Think Outside the Keyword Box: Creative brainstorming. 3. Topics: Getting data behind topics and the keywords that fuel them. 4. Know your competition: Defining the topics your competitors are strong at. 5. Search intent discovery: From purchases to research and comparison, identify what content the searcher wants to find.